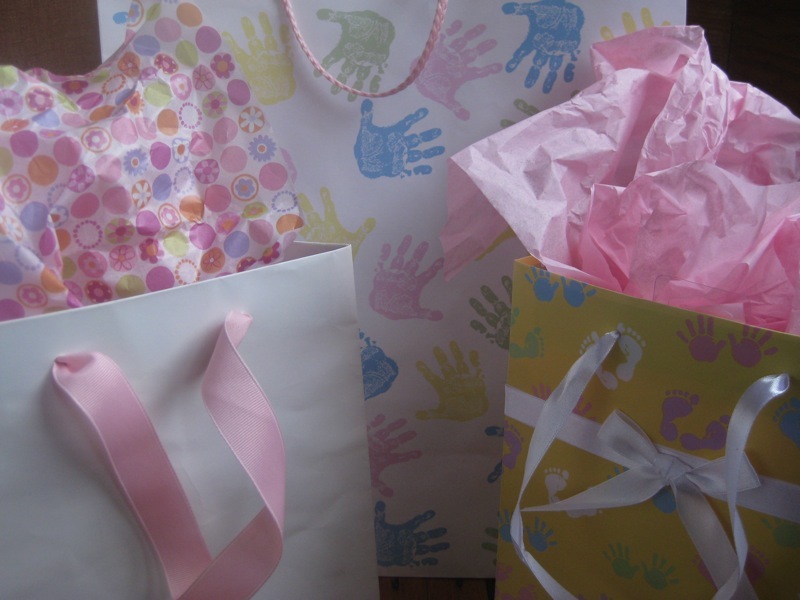 Throwing a baby shower is a great way to pamper and spoil a favorite mother-to-be in your life. Luckily, you don't have to spoil the planet as well - having an eco-friendly baby shower can be easy, affordable, and lets you get creative! Read on for green invites, flowers, decorations, and more! There’s an array of paperless invites on the web today, such as Evite, Pingg, and Paperless Post, so have fun choosing and personalizing the right invite. One of the best parts of digital invites is their versatility: you can get a quick headcount and up-to-date RSVPs whenever you want. Likewise, sending out email reminders (or thank you’s) for guests is a cinch as well. If you want a keepsake for the baby scrapbook, print out one or create one for the parents-to-be (everyone else will likely throw it away). Having a shower at someone’s home is a great start: It can be cozy, comfortable, and easy to personalize (and it’s also a way to minimize costs). At a restaurant or other venue, you are likely to be constrained by their own decor and table settings; having a shower chez vous lets you start from scratch and be inspired by the guest of honor and any of her preferences for the baby’s nursery. Easy ways to decorate include flowers (more to follow), eco-friendly balloons, and framed photographs of the mother and father to be as babies. I’ll use any excuse to be crafty too, so I created a garland made from recycled baby gift bags. There are obviously tons of cute disposable paper products available everywhere, but making small eco-friendly purchases can have a big environmental impact. Choosing a cloth tablecloth instead of paper is one easy way to reduce trash at the party, especially if you have one already or can borrow one. Using your own plates or china eliminates the need for disposable plates. The above pictured Paul Timman plates would be perfect for a baby boy shower for example. Since we were keeping with a color theme that didn’t jive with my plates, I ended up buying some 100% recycled paper plates and recycled napkins made with water-based inks. Other tableware options could be reusable and stylish bamboo plates and utensils. For most of the year, finding seasonal flowers to adorn your table should be as easy as a trip to the farmer’s market. In winter, this proved a bit more difficult. I found some fairly traded flowers at Whole Foods as well as tulips from about 200 miles away. Another option for organic and fairly traded flowers would be Organic Bouquet, where you can find a wide range of different flower styles and types. Other floral options could include terrariums (which could then be given as a gift to the mama-to-be) or grow-from-seed plants like the Eggling shown above. Our mama-to-be is a major foodie, so we ordered organic, vegan chocolates from Lagusta’s Luscious to give as favors. To honor her love of animals, we also made a donation to her favorite local animal shelter, from which she has rescued two dogs. Donations to maternal health non-profits or to organizations that provide baby necessities such as cribs, diapers, or food would also be wonderful in lieu of favors. For second and third time Mamas who already have most of the baby necessities, consider making the entire shower into an opportunity to donate goods to less fortunate mothers. You can still celebrate the mama-to-be in your life with toasts, well-wishes, and good company and help another mother-to-be with less means get off to a great start! 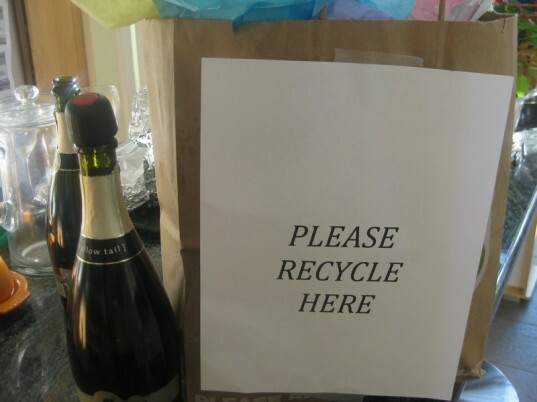 I often have to restrain myself at any event where presents are unwrapped and paper, ribbons, etc are stuffed into a trashbag without any consideration as to whether they can be reused or recycled. To eliminate this problem, I created a bag system: one bag for trash, including paper that couldn’t be recycled and one bag for reusable items, such as non-shiny or non-glittery paper, bags, and bows. I also placed a bag for recyclable cups, bottles, etc on the counter above where my trashcan was located; that way people would see it first and recycle it before throwing their trash away. We ended up with only a small bag of trash, and a big bag of recyclables! In the end, it was a classy, tasty shower that honored a wonderful, giving Mama as well as the environment! 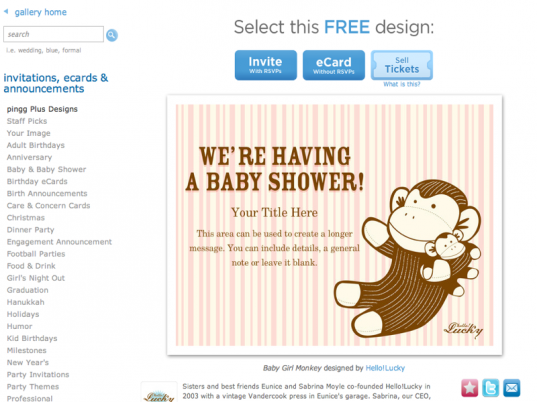 Invites There’s an array of paperless invites on the web today, such as Evite, Pingg, and Paperless Post, so have fun choosing and personalizing the right invite. One of the best parts of digital invites is their versatility: you can get a quick headcount and up-to-date RSVPs whenever you want. Likewise, sending out email reminders (or thank you's) for guests is a cinch as well. If you want a keepsake for the baby scrapbook, print out one or create one for the parents-to-be (everyone else will likely throw it away). Decorations Having a shower at someone’s home is a great start: It can be cozy, comfortable, and easy to personalize (and it’s also a way to minimize costs). At a restaurant or other venue, you are likely to be constrained by their own decor and table settings; having a shower chez vous lets you start from scratch and be inspired by the guest of honor and any of her preferences for the baby's nursery. Easy ways to decorate include flowers (more to follow), eco-friendly balloons, and framed photographs of the mother and father to be as babies. 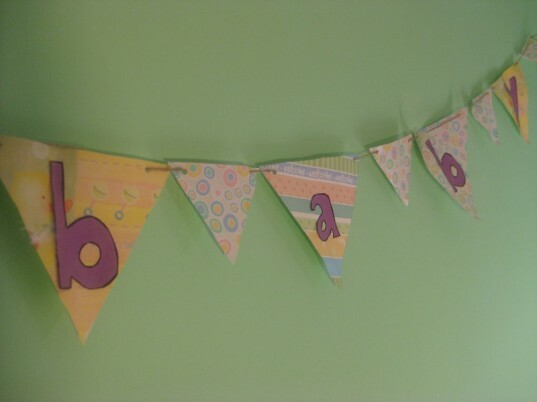 I'll use any excuse to be crafty too, so I created a garland made from recycled baby gift bags. Tabletop There are obviously tons of cute disposable paper products available everywhere, but making small eco-friendly purchases can have a big environmental impact. Choosing a cloth tablecloth instead of paper is one easy way to reduce trash at the party, especially if you have one already or can borrow one. Using your own plates or china eliminates the need for disposable plates. 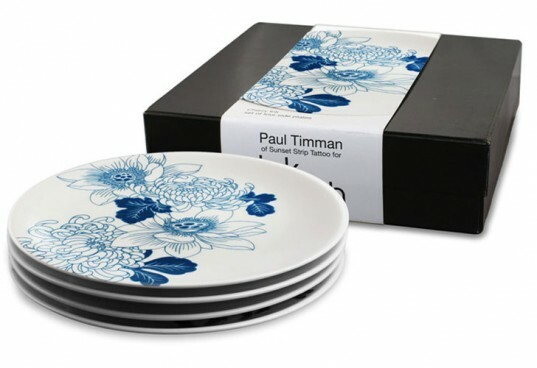 The above pictured Paul Timman plates would be perfect for a baby boy shower for example. Since we were keeping with a color theme that didn’t jive with my plates, I ended up buying some 100% recycled paper plates and recycled napkins made with water-based inks. Other tableware options could be reusable and stylish bamboo plates and utensils. Flowers For most of the year, finding seasonal flowers to adorn your table should be as easy as a trip to the farmer’s market. In winter, this proved a bit more difficult. I found some fairly traded flowers at Whole Foods as well as tulips from about 200 miles away. Another option for organic and fairly traded flowers would be Organic Bouquet, where you can find a wide range of different flower styles and types. 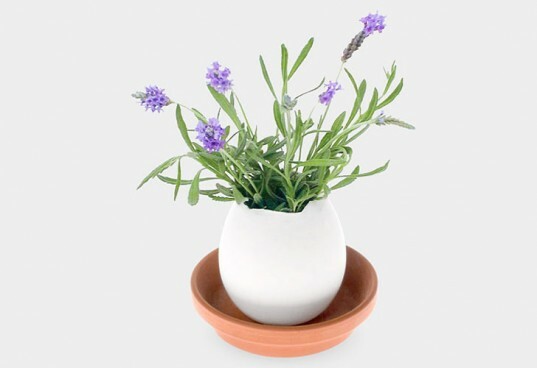 Other floral options could include terrariums (which could then be given as a gift to the mama-to-be) or grow-from-seed plants like the Eggling shown above. Food and Drinks Continue with the "from scratch" theme and make the shower a home-grown affair. By having friends of the mama-to-be cook and bake, you can lessen the number of miles that the food (and the ingredients) traveled, especially if you let the others know you’d like the menu to be as eco-friendly, local, and organic as possible. 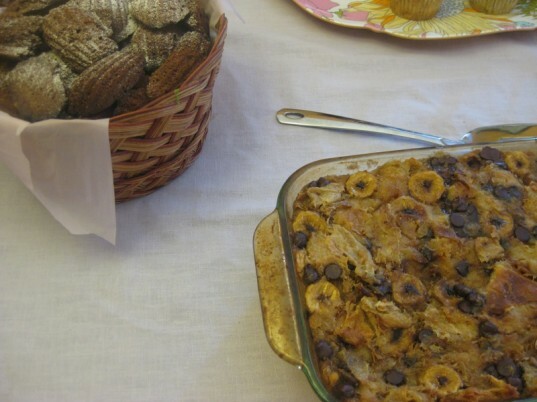 Among our menu items were bagels and a cake from a local bakery, vegan muffins, vegetarian dumplings, homemade madelines, and a bread pudding made from croissants from a local pastry shop. Brew some organic, shade grown coffee and organic tea for beverages. For a healthy boost, serve fresh organic juices (bonus points if you grow the fruit yourself!). Favors Our mama-to-be is a major foodie, so we ordered organic, vegan chocolates from Lagusta’s Luscious to give as favors. 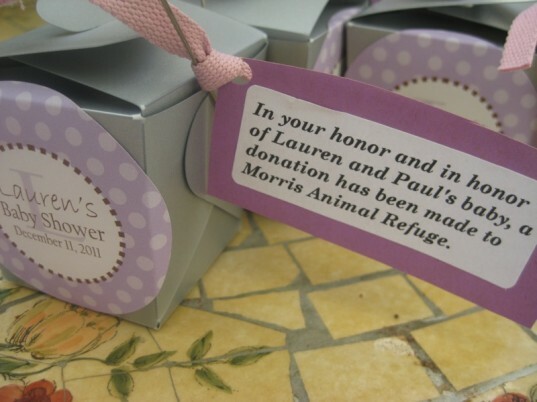 To honor her love of animals, we also made a donation to her favorite local animal shelter, from which she has rescued two dogs. Donations to maternal health non-profits or to organizations that provide baby necessities such as cribs, diapers, or food would also be wonderful in lieu of favors. And All the Rest I often have to restrain myself at any event where presents are unwrapped and paper, ribbons, etc are stuffed into a trashbag without any consideration as to whether they can be reused or recycled. To eliminate this problem, I created a bag system: one bag for trash, including paper that couldn't be recycled and one bag for reusable items, such as non-shiny or non-glittery paper, bags, and bows. I also placed a bag for recyclable cups, bottles, etc on the counter above where my trashcan was located; that way people would see it first and recycle it before throwing their trash away. We ended up with only a small bag of trash, and a big bag of recyclables!